**Guests will have to make their reservations before 11:59pm on 12/20 in order to receive the group rate. Book a room at the newly renovated DoubleTree by Hilton Hotel Virginia Beach, where a friendly member of staff is waiting to greet you with a warm, freshly baked chocolate-chip and walnut cookie. Relax in one of our 292 spacious guest rooms, or upgrade to a Presidential Suite or Executive Suite. Each room features a 32-inch flat-screen HDTV, free high-speed internet access, and designer bath products. 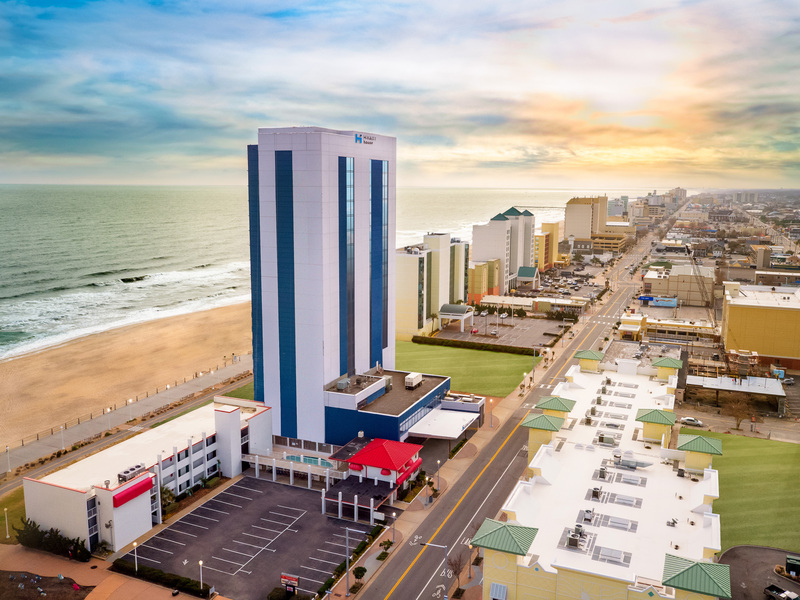 The hotel is located eight blocks from beautiful Virginia Beach oceanfront, and complimentary transportation is available daily to and from the hotel/beach from Memorial Day through Labor Day, and weekends throughout the month of September. We have ample complimentary parking and a state-of-the-art fitness center. Dine on gourmet burgers and house specialties at Max & Erma’s Restaurant, or take advantage of the In-Room Dining service and have your meals brought to your room. 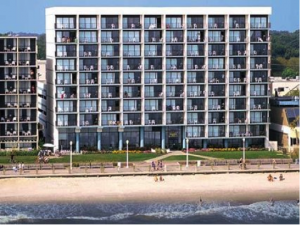 Everyone will be jolly when you stay at the Newest Hotel on the Virginia Beach Oceanfront! The Hyatt House is located in the center of the race course and our special rate is for runners, fans, elves, and nutcrackers (sorry no scrooges allowed). Fans can ring their jingle bells and cheer the runners on from their oceanfront-boardwalk balcony with their eggnog in hand. This rate includes a wonderful hot breakfast with an omelet station, use of our indoor pool, and fitness room. Choose a room with one king bed with queen sleeper sofa or a room with 2 queen beds. Hotel restaurant will run dining specials for all racers. Free sled & car self-parking ($14 for valet). To receive this special rate you must book prior to Thanksgiving. Newly renovated! The Courtyard Oceanfront South on 25th Street offers 100% oceanfront rooms located in the heart of the boardwalk close to shopping, dining and entertainment. Each of our spacious rooms and suites feature plush bedding, 32″ flat screen HD television, a mini fridge–and a private furnished balcony facing the ocean. Unwind in our sparkling pool and whirlpool spa. Grab a quick bite from our Bistro, which offers healthy choices, a variety of breakfast and dinner options, an evening bar, and specialty beverages made with Starbucks® coffee. Our Marriott Courtyard offers complimentary Internet throughout the entire hotel as well as complimentary parking for guests. In addition to the great amenities at our Virginia Beach Courtyard hotel, we’re proud of our service. Come and give us the opportunity to serve you! Inspired by Thomas Jefferson’s Monticello and built in 1927, The Cavalier Hotel was designed by Norfolk, Virginia-based architect Clarence Neff and became an instant landmark that is now listed on the National Register of Historic Places. During its heyday, The Cavalier changed the landscape and social scene of Virginia Beach’s oceanfront playing host to ten U.S. Presidents, dozens of celebrities like Elizabeth Taylor, Judy Garland, Doris Day, Muhammad Ali and Frank Sinatra, and was a major venue for performers in the Big Band era like Benny Goodman and Glenn Miller. A Virginia icon, The Cavalier Hotel (cavalierhotel.com), reopened its oceanfront doors early 2018 after a nearly $85-million+ restoration. Set high atop a hill overlooking the Atlantic, The Cavalier’s striking entrance remains much as it did back in 1927. Guests are transported back in time as they arrive to the original four column portico and brick porte-cochère. The magnificent lobby captures the influence of the roaring 20’s and the jazz age. Soaring ceilings, sparkling fixtures, and ornate architectural moldings instill a sense of place and history. Each of the 62 guest rooms and 23 suites were designed to create a sophisticated residential experience. Plush fabrics, designer accents, and new rich finishes blend seamlessly with classic architecture. Rooms are outfitted with claw foot tubs, marble baths, and first-class amenities like monogrammed embroidered slippers, robe and towel, and Molten Brown toiletries. A brand new distillery onsite delights guests with a tasting room, distillery tours, and the opportunity to create and distill their own barrels, as well as purchase The Cavalier’s signature bourbon, gin and vodka made on-site. The historic Raleigh Room, with its magnificent fireplace, will become the heart of the new Cavalier featuring billiards, game tables, drink carts and seating on rich velvet in jewel-tone colors among a tall and luminous back bar. Foodies will be delighted by Becca, a restaurant and garden, serving inspired farm-to-table fare made with local ingredients. A brand-new full service spa and reinvented fitness center has been added near the spectacular indoor pool area. Welcome to the Comfort Inn & Suites Oceanfront, an award winning Virginia Beach Oceanfront Hotel. Located in the heart of the resort area, the Comfort Inn & Suites Oceanfront is right on the boardwalk providing a breathtaking view of the ocean. All of our two room units are oceanfront and contain two queen beds or one queen bed and a queen sofa sleeper. Every unit contains two flat screen TVs, an in room safe, a refrigerator, microwave and coffee maker. Start your day with our free hot breakfast featuring eggs, meat, yogurt, fresh fruit, cereal and more, including hot Belgian waffles! Relax in our heated indoor pool and hot tub. Stay connected with the world in our business center or with our free high speed wireless internet access. Our exercise room features an array of fitness equipment to meet your conditioning needs. We also provide one parking space per suite in our on site parking garage. The entire staff at the Comfort Inn and Suites Oceanfront looks forward to serving you and is dedicated to ensuring that your stay with us will be pleasantly memorable. Welcome to Comfort Suites Beachfront, and to your own tow-room suite overlooking the Virginia Beach boardwalk. Relax and experience our newly renovated hotel, where every room is an oceanfront, two-room suite with private balcony.Enjoy the holiday lights from your living room, and along with your separate bedroom, sleep sofa, microwave, refrigerator, wet-bar and two high-definition HD TV’s. Wake up to a complimentary hot breakfast, complimentary wireless internet, oceanfront fitness center, market and guest laundry. Make your reservation now. We look forward to seeing you! NEWLY RENOVATED 2018! All guest rooms and public space were renovated in 2018! Including 55 inch TV’s, Internet on TV with Netflix, in-room safes, refrigerator and microwaves in all rooms. Breakfast and lobby feature 55 inch TV’s and charging ports in tables. Your memorable getaway awaits at Fairfield Inn & Suites Virginia Beach Oceanfront. Our hotel offers spectacular views with a beachfront location just steps from the water and boardwalk. 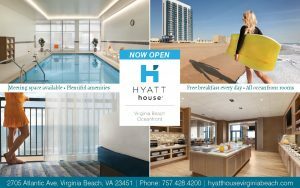 We also provide easy access to Virginia Beach Convention Center, Naval Air Station Oceana, Virginia Aquarium & Marine Science Center and Ocean Breeze Waterpark. After filling your day with new experiences, settle into our kid-friendly rooms and suites, featuring complimentary Wi-Fi, flat-screen TVs and private balconies with oceanfront views. Following a relaxing night on our plush bedding, fuel up at our free daily breakfast buffet. Squeeze in a workout any time thanks to our 24-hour fitness center. During downtime, enjoy a soothing dip in our indoor pool. Live in the moment at our Virginia Beach oceanfront hotel! Get more out of your visit with a stay at SpringHill Suites Virginia Beach Oceanfront. Living up to our name, you’ll be steps away from the crystal-clear waters, warm sands and mellow atmosphere of Virginia Beach. Following an eventful day, settle down in our spacious suites and browse your favorite social networks using our free Wi-Fi. Fuel up for your day with our complimentary hot breakfast, followed by brisk workout in our fitness center. During downtime, feel free to grab a cocktail from our Tiki Bar and relax by our outdoor pool with breathtaking vistas. Treat yourself to a renewing and inspiring travel experience at SpringHill Suites Virginia Beach Oceanfront. Right on the beach, The Oceanfront Inn features comfortable oceanfront rooms with balconies, heated indoor pool, casual oceanfront dining, complimentary WiFi, 1 complimentary parking space per room, complimentary fitness privileges at our local YMCA, and friendly staff at affordable prices. As an added feature, you can choose to add breakfast at Neptune’s Restaurant, opening at 7:00 a.m., featuring a range of light, quick choices and freshly cooked hot meals. Celebrate the season with us with your complimentary Holiday Lights at the Beach car pass.